I had used the term and have been the recipient and sometimes (striving to be better) sender of said “care” packages my entire life not realising that it referred to a specific charitable offensive, relief operation, founded on this day in 1945 and in full implementation six months later. Originally the initialism was short for Cooperative for American Remittances to Europe, for donation of $10, one could sponsor an individual and help stave off starvation in the war-torn continent. The couriers that delivered the CARE packages had the addressee confirm receipt and often this acknowledgment was the first confirmation that the individual had survived the war, lines of communication ravaged by the fighting. 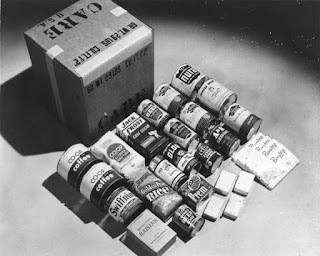 The first batch of food aid were US army surplus rations used until exhausted that were prepared for the contingent invasion of Japan. By 1948, the board of directors dropped the requirement that donations be directed to a named individual due to an overwhelming number of requests to send the package “to a teacher” or “a hungry person in Europe” and donated items supplemented the Berlin Air Lift during the Soviet Blockade. By the mid-1950s, operations transitioned out of Europe and the relief agency took on a global role, not only fighting hunger but also promoting environmental stewardship, educational opportunities and micro-finance. The acronym presently stands for Cooperative for Assistance and Relief Everywhere.